Rationale is the first high-quality "argument processing" software. 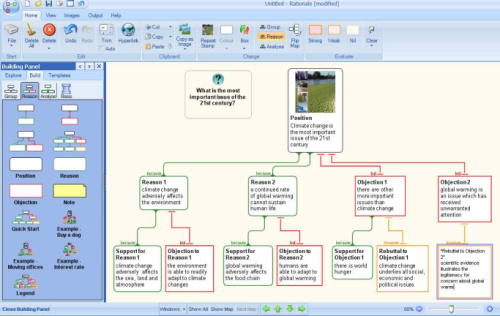 Use Rationale to create "argument maps", diagrams of reasoning and argument. Rationale will help students learn the fundamentals of good reasoning, critical thinking, and argumentative essay writing. Three Map Types. Use Grouping, Reasoning, or Analysis maps depending on the thinking task and level of sophistication. High quality visual design. Attractive and intuitive workspace and user interface. Drag and drop. To create and manipulate maps. Undo/Redo. Undo any operation, as many steps back as you like, and redo to get back. Templates. Drag-and-drop pre-built arguments, or argument schemes onto the workspace. Helps save time and promote learning. Essay Planning. A wizard to guide students in constructing argumentative essays. Rich output. Output to vector and bitmap graphics and text outline formats. Powerful map viewing. Reorganise complex maps to aid comprehension. Browser and scratchpad. Staging posts for information. Drag and drop onto workspace. Support. Comprehensive support materials, including guides for educators and professionals.